Build Enough Bookshelves: Happy Easter 2014! This year I've tried to step it up a bit in my Easter observances. In addition to my Lenten practices (reading the entire New Testament and moderating my tone and volume, especially at home), I've been faithful about using my homemade Easter "Advent" binder with my kiddos every day this week. 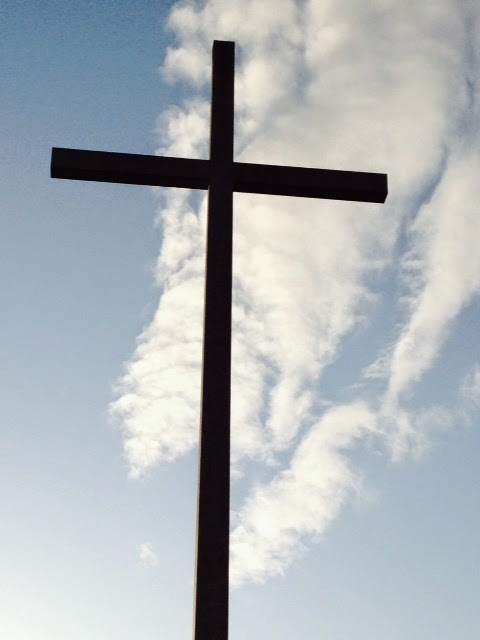 Each day we read the scriptures that describe the events that day of Holy Week, as well as a story or poem from a Church magazine about Easter and sing a hymn or children's song. Last Sunday evening I attended the Spokane East Stake's performance of selections from Handel's Messiah. That's definitely an ambitious project for a stake, and I especially appreciated the sing-along portions. 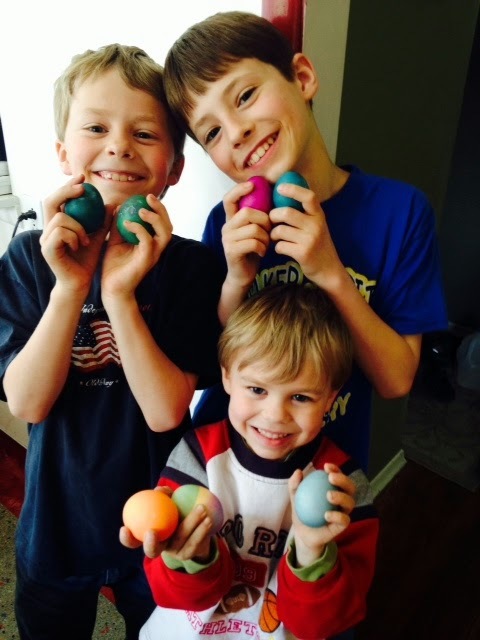 Yesterday we dyed Easter eggs. This year, for the first time, I experimented with some natural dyes: beets (for red), turmeric (for yellow), and red cabbage (surprisingly, for blue! ), in addition to the normal food coloring dyes for orange, green, and purple. The yellow turned out wonderfully and the cabbage yielded a lovely soft gray-ish blue once the egg sat in the dye for almost an hour or so. I think I didn't use enough beets, though, because even after a long time the best red we got was a blushing beige. 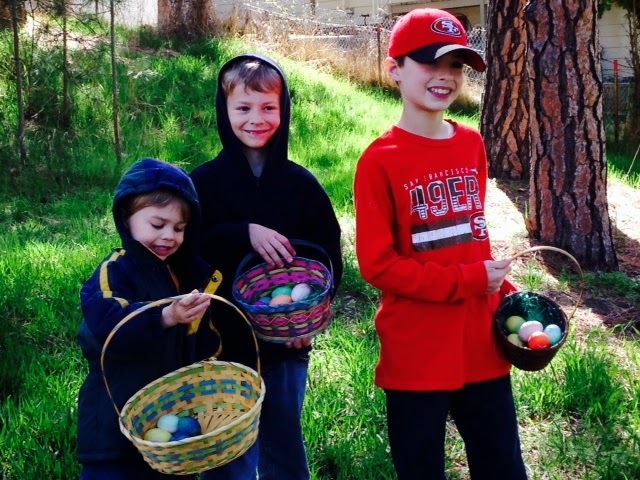 a few of their Easter eggs. 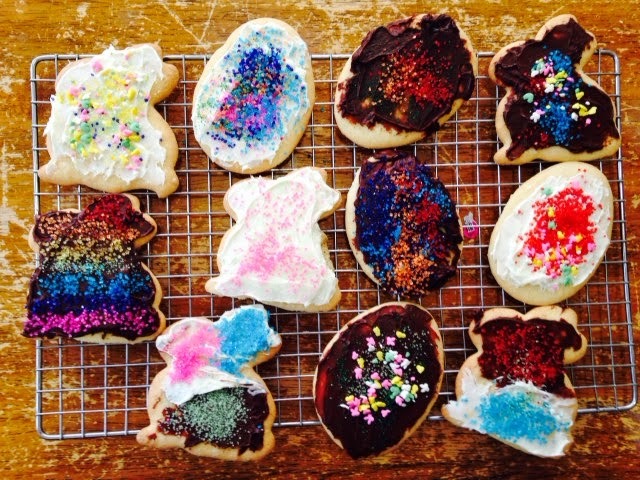 Yesterday afternoon we decorated some sugar cookies I got from Bountiful Baskets. That rainbow bunny on the left is my creation. The boys were impressed with my mad decorating skills. Then I got up early this morning to attend the non-denominational Easter sunrise service at Greenwood Memorial Terrace. It was a little chilly - the regulars were easily identified by the blankets they knew to bring - but it was beautiful and clear and crisp and a wonderful setting for an Easter message. After readings of several scriptural passages (Acts 10:34-43; Psalm 118:1-2, 14-24; and Matthew 28:1-10), Rev. Mark Klohe gave a brief sermon on how the Resurrection should affect us every day, how it should change the way we see ourselves and the way we treat others. Along with hymns and prayers, a very Christ-filled service. Terrace. It was a beautiful, clear morning! The rest of the morning was fairly quiet. I listened to the MoTab's recent performance of Handel's Messiah - the whole thing! - and you can listen/watch here. The boys watched the VeggieTales Easter Carol video. We got ready for our regular church services this afternoon, which featured some beautiful pieces by our ward choir and some good Christ-centered talks and lessons. And dinner was at my parents' house: delicious lamb, various veggies, and other yumminess. It's been a good Easter season.